Your crusade to destroy the current practice of military history on battlefields is a form of fundamentalism just like the supposed fundamentalism of military history you aim to change. That's not a quote, it's a paraphrase of a very long and understandably upset missive from more than a year ago. I've heard similar criticism since I've begun evangelizing a different model than the one we've been practicing within military landscapes in the public sphere. One of the phrases I've used on and off to describe the problem with the current state of military history as it is practiced on Civil War landscapes is "boxes on a map" history. Presentations and interpretive offerings tend to bog down in the details and minutiae of troop movements and tactical shifting across a landscape. The argument is, admittedly, a strawman. But strawman arguments allow for discussion around the grand challenges that face us by looking at pure expressions of problems we all have to greater or lesser degrees. No one is always a sinner. No one is always a saint. To even intimate that I don't understand that (or anyone for that matter) is not fair. So the strawman of "boxes on a map" history in Civil War landscapes doesn't exist in its pure form anywhere within the modern expression of Civil War interpretation. On the flip-side of the same coin, though, the "boxes on a map" model is expressed to greater and lesser extents everywhere on the landscape. I went to a short orientation talk at a Civil War site a couple months ago. The talk was solid historically, discussing rebel forces striking a Federal defensive line in correct and honest detail. But that's all it was. The battle was taken as significant as a foregone conclusion. The crucial argument was never advanced that we should care about that place personally. This battlefield was significant, the interpreter seemed to vainly say, because it was a significant battlefield. This battlefield deserved to be preserved, they said through the program they presented, because it was a battlefield worth preserving. I'm not convinced this sort of argument from inherent relevance and significance will work with a modern audience worried about how their state and federal governments spend precious dollars. Why does this or that battlefield deserve to be preserved using tax dollars? Why should I contribute to a private preservation organizations' coffers? Why, in the basest form of the question, should I care? So what does a new model look like? At its heart, it is not throwing out military history like a baby with the bathwater. It's not even damning that baby as belonging to Rosemary. The model and shift is far subtler. The argument for that shift has been forceful since I started this quest of talking about what the future of Civil War Interpretation needs to be over two years ago. To some extent, that has been because the problem seems so intractable and entrenched. To a greater extent, that's just my personal way of finding new ideas. I'll argue strongly for one philosophy, hoping and praying that others will do likewise. Then we can dialogue, discuss and start hashing and lashing our philosophies together into a workable whole. But when it comes to talking craft, it seems like very few are joining that conversation. Maybe they feel it is improper to discuss how we do what we do. Maybe they simply have never thought about it, and doing some deep philosophical soul-searching is so foreign as to frighten. Most likely, they are simply tired at the end of a hard day. Sometimes this blog feels like screaming into a void. One reaction (maybe the sane one) is to stop screaming and move on. My reaction has been to scream louder. But the change I have been progressively screaming louder about isn't that radical or new, just an evolution of where the field of heritage interpretation has been heading as a whole for over half a century. The new model for a truly meaningful and interpretive future for Civil War landscapes is about leveraging the military story in a way that is meaningful to a broad American audience personally and deeply. In the past, I've used the metaphor of a painter's canvas. The factual and functional elements of history, when one is practicing interpretation, is the canvas upon which the interpreter helps to paint diverse meanings using the paint of the visitor's heart. Metaphors are really nice because they can make you feel warm and squishy. But what does this look like in practice? It's about leveraging the past toward a meaning. It's about thinking interpretively first and foremost. It's not about stepping into a program with the stated goal of a visitor walking away knowing something, but instead feeling something on a visceral level. In the darkness of the night of September 14th, 1862, Confederate General Thomas Johnathan "Stonewall" Jackson ordered A.P. Hill's to move his division of approximately 5,800 men around the left flank of Dixon Miles' defensive line on Bolivar Heights. 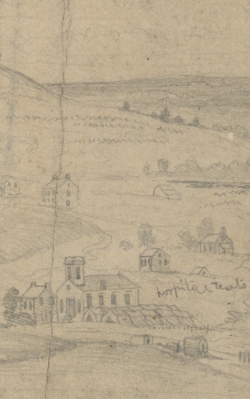 Hill's men traveled by a wagon road and railroad tracks along the Shenandoah River, moving infantry and artillery into position for a final assault on the morning of September 15th. 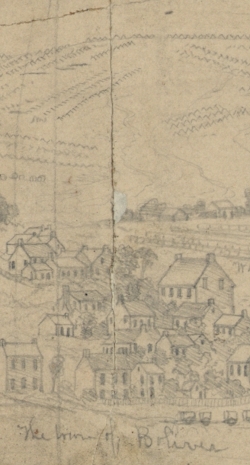 Lieutenant Colonel R. Lindsay Walker's brigade of artillery, comprising batteries from Virginia and South Carolina, unlimbered their guns in the darkness on the fields of the Chambers Farm. 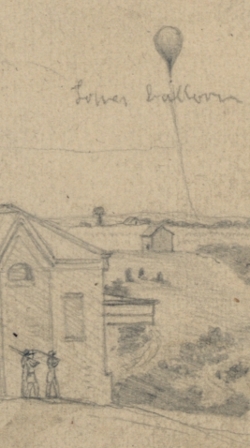 When fog lifted the next morning, Confederate artillery opened up from Loudon Heights, Maryland Heights, Schoolhouse Ridge and now the left flank of Miles' men at the Murphy Farm, completely enveloping his force. Infantry moved forward on Bolivar Heights from the new position on the Federal left flank, Branch's North Carolina brigade and Gregg's South Carolina Brigade putting pressure on the 125th New York Infantry and the Third Maryland (Potomac Home Brigade). Shot and shell rained down on the defensive lines that the Federal forces had established on Bolivar Heights and Camp Hill, trenches filled units from New York and Ohio. Cut off completely from escape and their line of supply, Miles and his 12,500 men were forced to surrender to the superior Confederate force. Along with Miles' captured Federal soldiers, the Confederates also seized around 5,000 Contrabands and took them back south. This is the story of the final phase of the battle at Harpers Ferry, a relatively straight forward affair. There is movement, there is outflanking, there is what some have described as Jackson's most brilliant victory of the war. But fundamentally there are boxes and bars, both red and blue, moving across the map in a tactical ballet. And there is no meaning. There is no reason to care. War is dangerous. It's destructive. It tears people apart. As darkness fell on Bolivar Heights on September 14th, 1862, Federal commander Dixon Miles' men were in a tight spot. But it wasn't inescapable. There was still hope that their compatriots commanded by George McClellan might come to their relief. They might escape to fight another day and, God willing, to return home to their wives and sons and mothers in New York or Ohio or across the Potomac in Maryland. The sleep that night, with rebels surrounding you on three sides, would have been fitful if you got any at all. The next morning, you would wake up. Thomas Johnathan "Stonewall" Jackson's men are still there in your front. To your right, they still loom on the crest of Maryland Heights, they still hover over you in the rear on Loudon Heights. But they are hidden behind banks of fog. The sun comes out, the fog begins to burn off. You glance to your left and see something new. There, on a low ridge, are batteries of artillery and infantry. Flapping above their shoulders are flags, not the Stars and Stripes, but a blue cross on a red field. A.P Hill's 12,500 men have outflanked you, gotten onto your left side and cut you off from the only possible escape. You've been out-thought, out-maneuvered and out-matched. The guns open up on your lines. The fire is so tremendous and panoramic that you feel like the only safety would be to crawl under the earth. Now, you know your fate: either death or capture. White flags begin flying from hundreds of upturned muskets, swords and sponge-rammers all across the ridge. You're safe now. But for how long? Only your captors know. And what about the nearly 5,000 men, women and children, former slaves who have run to your lines for safety? War is dangerous. It's destructive. It tears people apart: soldiers from their wives and children and mothers with cruel bullets and red-hot iron; mothers from their children and lovers with the whip and the manacle. This piece is moving toward meaning, toward attempting to feel and experience the place versus simply understanding it. In my professional work with the NPS, I've been advocating that interpretation is, at its heart, all about the emotional connection. Pure fact cannot be considered interpretive in any meaningful sense of the word. This is not revolutionary, it's a concept that Freeman Tilden piloted in 1957 with his Interpreting Our Heritage (“Information, as such, is not Interpretation”) and David Larsen echoed again in Meaningful Interpretation using the words of Tanaka Shozo (“The care of rivers is not a question of rivers, but of the human heart”). But it's key. This is my fight. I am not Andrew Jackson. This is not a crusade where I earnestly scream platitudes (I may scream them in jest or for dramatic effect) like "The Bank Military History: I will kill it!" This is a canvas model, a re-appropriation of military history for a grander cause. It is leveraging knowledge of military history as a canvas upon which a broader personal meaning for a landscape is painted for all Americans and not just a subset. It is broadening and finding a reason people should care about troop movements. Most times, that comes through personalizing them and finding the human dimension of the story in deep, pervasive and meaningful ways. But it's not a baby-and-bathwater argument. Rudy, after I got past the lengthy introduction about what your approach is and is not, I finally understood (felt!) what you were trying to tell us through the Harpers Ferry examples. I then wondered who in their right mind would be against this approach to feeling and experiencing instead of simply understanding the events on the battlefield. Frankly, I think you give far too much introduction and buildup to what is a straightforward concept that speaks for itself. Perhaps people get too bogged down in the buildup and straw man to grasp your point. I saw both examples in action during the Gettysburg Sesquicentennial. I’ll skip the “simply understanding” examples, and instead point to Ranger Christopher Gwinn who did a magnificent job of making visitors feel and experience the inglorious, confusing, and often pointless fighting on Culp’s Hill the morning of July 3. I’ll never forget the stories of Union officers forced to execute attacks they knew would fail, men hurt more by friendly fire than enemy fire, and one officer who lost both of his arms, relying on his family to take care of him for the rest of his life. I left Culp’s Hill that morning feeling somber and crestfallen, and that was just from less than two hours of walking and talking. Good piece! I've toured Civil War sites for decades and the details of the battles are not what interest me. I'm fascinated by the landscape and the idea that thousands of men marched here, ate here, camped here, risked their lives... It awes me! Now the landscape is different, often very serene. What brought these people out of their homes far away to come here at great sacrifice? What does it say about us? The actual quality the numismatic gold coin is offered ranging from mint condition to what's considered as the perfect gold coin. In order to invest well in gold numismatic cash Craig Hamilton, a trader should be very educated because they pose a high risk.